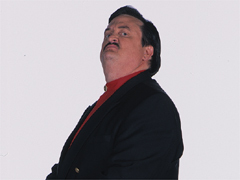 Favorite Quote: I'm Paul Bearer and you are not! First arriving into the World Wrestling Federation as the Undertaker's keeper, Paul Bearer turned on the phenom and masterminded an evil plot to destroy the former Federation Champion. But when the Undertaker decided he wanted to return to the Dark Side, he reunited with the "evil, detestable" Bearer to keep him focused on the task at hand. Their union has once again been severed, as Paul has since aligned himself with his son, Kane. Together, the duo have been punishing nearly every Superstar on the roster. Paul has been missing as of late, but one can only wonder what sort of chaos he will bring once he returns.